With sadness, the Department of Medicine marks the passing of philanthropist George A. Mosher (pictured at right) of Milwaukee, Wisconsin, who died on January 31, 2019, at the age of 79. 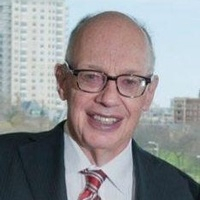 George and his wife Julie Mosher, who passed away in August, 2017, were instrumental in supporting the research program of Keith Meyer, MD, professor, Allergy, Pulmonary and Critical Care Medicine. George and Julie founded National Business Furniture together in 1975 and ran a successful business for over 30 years. George became an active angel investor later in his career, and enjoyed offering his time and talent to mentoring the next generation of budding entrepreneurs. Their philanthropic focus on interstitial lung disease honored Julie's diagnosis with lung disease in 2002 and subsequent lung transplant in 2008. "The Moshers were dedicated to supporting medical research to improve the lives of others with lung disease, making annual contributions to the George and Julie Mosher Research Fund, which supports research being done in the field of interstitial lung disease by Dr. Meyer," said Pete Schemling, senior director of development, Department of Medicine.